The exhibition will be open for the public from Thursday 16th October 2003. �ntonio Segui, one of the greatest Latin American painters of our time, was born in Cordoba, Argentina in 1934. Since 1963 he lives and works in Paris. His house, an old listed building at the Parisian suburb of Arcueil - once belonging to the chemist, biologist and revolutionary Raspail - has now turned out as a museum that keeps the artist's secrets and memories carefully hidden from its visitors. Segui spends there nine months of the year working on his representational painting while the rest of the time he spends in Buenos Aires. Rare works of Pre-Colombian and African art coexist in his studio showing his great interest in collecting objects. As the artist himself comments, '...in order to retain the memory of things one must have their presence; that's why I collect objects'. A citizen of the world, Antonio Segui, after finishing his studies at the San Fernando Academy in Madrid and the Ecole des Beaux-Arts in Paris - where he would return in the 80s' as a professor - he travelled in North Africa, Latin America and mostly in Mexico. These places have greatly enhanced his multicultural approach to things as well as the perceptive capturing of the pulse and the aura of contemporary urban culture. Segui's work does not lend itself to historical or aesthetic classification. As Edward Lucie-Smith notes in the bilingual luxury edition that accompanies the exhibition '...he is keenly aware of the way in which the supposedly experimental avant-garde has in fact been transformed into a kind of academy, and he is determined not to be caught in this trap. At the same time, he remains keenly aware of what the original Modernists achieved, and is not afraid to incorporate some of their discoveries in his own work'. The artist himself dislikes this kind of labelling and points out the major role luck plays in artistic creation. A study of the elements which make up his work would show us that there is not one but several stories, a kind of record of contemporary social reality and artistic developments. Already since the mid-60's Segui wished to express the present, using elements of Pop Art (mainly photography) and 'Figuration Narrative' - where elements from the everyday life, autobiography, mythology and sociology are being used - always maintaining though his core subject, the human nature. The painting of Antonio Segui undoubtedly forms part of the expression of the contemporary urban world. The artist is rightly described as the painter of cities. Especially after 1980, cities in his work appear in series, making up sequels as well as self-contained stories. As Martha Chalikia, the curator of the exhibition mentions in the catalogue '...What we have here is a composition of elements, a visual fusion of different images as part of an attempt to create a new landscape in tune with current conditions. In these scenes he builds and dramatises the modern image of the labyrinth, of multiple directions where everything is relative and seems to be part of a strange game between madness and pain. The element of imagination can be seen in images with a fairy-tale charm which at the same time reveal a clear disappointment as a results of an adult's critical approach'. Central figure in Segui's work is Gustavo. This male figure attests to the influence of Argentinean tradition and reflects the exploits of Buenos Aires' first inhabitants, the legendary Gauchos. These people with the identical faces-masks form part of the city, mixing with every dark corner of it, becoming one with its pulses, expressing its turmoil. The artist, in expressing the misery of their existence he realises that the only way out, the only way to survive is a sense of humour and self-sarcasm. This is '...the only thing that can save us', in life as well as in art, he comments. This is a way of thinking, a life attitude based on the timelessness of human parody. The retrospective exhibition of Antonio Segui will be presented in the Frissiras Museum's main premises (3, Monis Asteriou Str.) 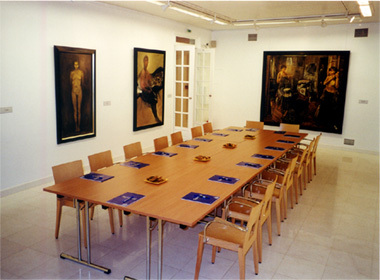 until the 8th January 2004 and aims to give the opportunity to the greek audience to discover a major part of his work. More than 70 works are going to be shown, from 1960s' and his famous collages on cut out wood, up to his current painting creations. Guided tours: From 25/10 every Saturday and Sunday at 12:30.